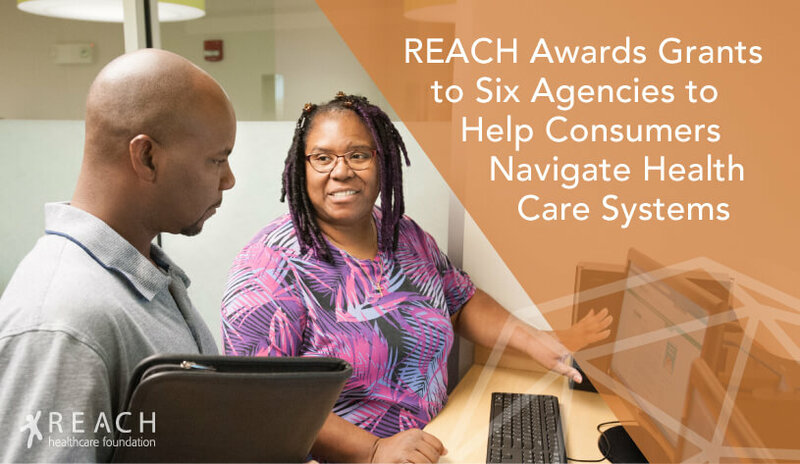 This month, the REACH Foundation awarded grants totaling $213,102 to six organizations to implement strategies that use care coordinators, navigators, community health workers and engagement specialists to close the information and resource gap between consumers and health systems. The Health Care Coordination and Navigation Grants align with the foundation’s strategic plan focus on eliminating barriers to health access and care within the outcome area – Strong Safety Net. The 2017 grants are aimed at addressing the health care needs of homeless individuals, undocumented and documented immigrants, migrant workers, refugees and youth transitioning out of foster care – population groups that experience greater health disparities due to economic situation, language and culture, housing insecurity and other factors. The Health Care Coordination and Navigation grants represent a partnership with organizations that have demonstrated success in working with these population groups and in implementing peer support models that improve access to health care services. $40,000 Working primarily with Spanish-speaking, new immigrant and low-income individuals, provide health navigation services to individuals and families in Johnson and Wyandotte counties, KS, to help them enroll in coverage and understand their benefits plans, make health appointments, secure specialty care and navigate payment requirements. Navigators also serve as advocates for fair treatment and timely primary and specialty health care services. In 2016, El Centro provided assistance to more than 1,100 clients. $30,093 Working in partnership with the Migrant Farmworkers Assistance Fund, provide medical case management for migrant and year-round farmworker families in Lafayette County, MO. The Migrant Farmworkers Assistance Fund annually assists 200-350 individuals and family groups with health care coordination, transportation, interpretation, appointment scheduling and follow-ups and patient advocacy designed to address multiple barriers to care for the migrant workers. The project has served these roles for 33 years, focusing specifically on the needs of rural, seasonal migrant workers. $37,632 As the metro area’s largest refugee resettlement organization, JVS provides social services to hundreds of refugees and immigrants each year, including health education, health care navigation, patient advocacy, interpretation and community education. The JVS Healthcare Coordinator project puts in place intensive case management aimed at decreasing anxiety and alienation along with strengthening clients’ capacity to secure required health screenings and essential services for themselves and their families. The project will serve 150 refugee individuals and families, addressing medical, mental health and oral health needs, providing enrollment assistance, and teaching clients how to access care. $35,347 KCU’s Score 1 for Health program provides care coordination and health care navigation using registered nurses to engage with families on their children’s health screening and service needs. For this project, KCU will expand the work of a bilingual dental community health worker to provide health care navigation services and information to Latino families on oral health as well as primary care and vision services. The project will build on a pilot project in a Kansas City, MO, elementary school to assist with scheduling dental appointments and promoting preventive oral health care. The project also provides wrap-around support through referrals to school nurses, social workers and safety net health care clinics. $40,000 reStart has used care coordination services for homeless persons since 2005. In 2015, the organization formally structured the services to focus on chronically homeless single adults who often are high utilizers of emergency services. The care coordinator works to build trust and rapport with clients who exhibit multiple and complex health, mental health and chronic conditions in order better address their particular needs. Services include assistance with benefit applications, advocacy and legal referrals for benefits denials, assistance with scheduling appointments, transportation and chronic disease education. $30,030 Synergy Services opened an onsite medical, mental health and dental clinic in 2010 to overcome barriers that prevented homeless and runaway youth from receiving health services. This population often suffers from physical and mental health issues resulting from poverty, neglect and other conditions related to their homelessness. Synergy’s integration specialist works with the youth to help with appointments and follow-up, Medicaid applications and development of treatment plans. The integration specialist works closely with Synergy case managers, therapists and other staff on coordinated assessments and care plans. For more information on the Strong Safety Net outcome area and strategies, review the Funding Priorities section of the web site.